Autism spectrum disorder is associated with social and emotional deficits, the etiology of which are not well understood. A growing consensus is that the autonomic nervous system serves a key role in emotional processes, by providing physiological signals essential to subjective states. We hypothesized that altered autonomic processing is related to the socio-emotional deficits in autism spectrum disorders. Here, we investigated the relationship between non-specific skin conductance response, an objective index of sympathetic neural activity, and brain fluctuations during rest in high-functioning adults with autism spectrum disorder relative to neurotypical controls. Compared with control participants, individuals with autism spectrum disorder showed less skin conductance responses overall. They also showed weaker correlations between skin conductance responses and frontal brain regions, including the anterior cingulate and anterior insular cortices. Additionally, skin conductance responses were found to have less contribution to default mode network connectivity in individuals with autism spectrum disorders relative to controls. These results suggest that autonomic processing is altered in autism spectrum disorders, which may be related to the abnormal socio-emotional behaviors that characterize this condition. Dr. Jin Fan received his Ph.D. from New York University and then his postdoctoral training at Weill Medical College of Cornell University. Currently, he is an associate professor in the Department of Psychology, Queens College and the Graduate Center of The City University of New York. He also has the joint appointments in the Departments of Psychiatry and Neuroscience at Icahn School of Medicine at Mount Sinai and he is the director of the Laboratory of Neuroimaging. Through independent research and collaborations, Dr. Jin Fan has developed an Attention Network Test to provide a behavioral measure of the efficiency of the three attentional networks. 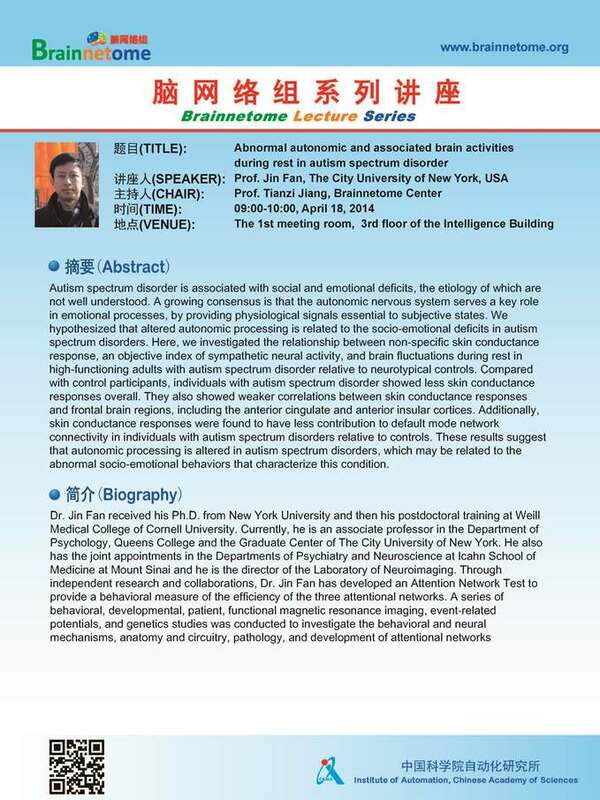 A series of behavioral, developmental, patient, functional magnetic resonance imaging, event-related potentials, and genetics studies was conducted to investigate the behavioral and neural mechanisms, anatomy and circuitry, pathology, and development of attentional networks.